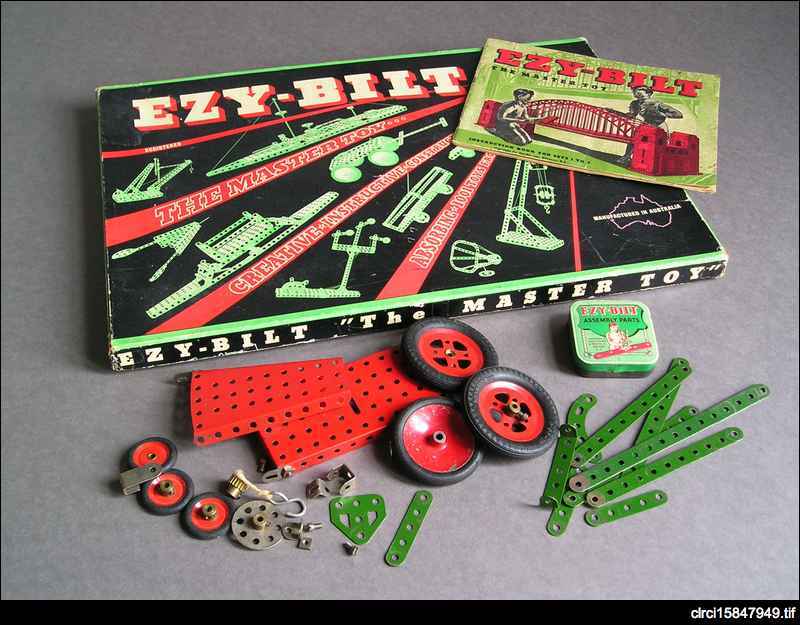 Boxed set of Ezy-bilt the master toy with instruction book and parts book; assorted metal sections, rods, and rubber tyred wheels; and Ezy-bilt assembly parts tins. Ezy-bilt was a South Australian made imitation of Frank Hornby's Meccano construction kits. Manufactured at Southwark, Adelaide, (now part of Thebarton) by Colton, Palmer and Preston, Ezy-bilt was a popular toy for budding builders and mechanics from the late 1940s until the 1960s. Colton, Palmer and Preston were not the only company to make construction sets in imitation of the famous Meccano. Others included the American system Erector and the German set Structator. Hornby patented his Meccano construction set in 1901. It uses a system of metal strips and plates with equal-sized holes at half-inch intervals. Even as the system evolved this did not change, so that older pieces could always be amalgamated with new sets. With wheels, rods and, later, motors real working models could be made. Hornby had initially called his construction set 'Mechanics made easy' and this reflects his intention. Rather than a child just building something with blocks, Meccano was a real engineering experience for children. Hornby also issued Meccano magazine in which further projects were published.